For centuries, the carvings on the hand and feet have always been fascinating not only to the anthropologists but also to the psychologists, sages, theologians, doctors, and laymen. Palmistry in scientific terms is called as “dermatoglyphics” and refers to the friction ridge formations, which appear on the palms of the hands and soles. It is a specialization of science that deals with the study of such patterns. The term was coined by Cummins and Midlo in 1926, although Cummins is regarded as “the father of dermatoglyphics.” The main thrust of their research was on Down syndrome and their characteristic hand formations. As from the cradle to the grave, until the body decomposes, the fingerprints remain unchanged. Their variable characteristics are not duplicated in other people, even in monozygotic twins. Thus, the study of dermatoglyphics is considered as a window of congenital abnormalities and is a sensitive indicator of intrauterine anomalies and complex genetic traits. The ridges are influenced by blood vessels–nerve pairs at the border between the dermis and epidermis during the prenatal development and factors such as inadequate oxygen, unusual distribution of sweat glands, and alteration of epithelial growth. Abnormal dermatoglyphic patterns may be observed in several nonchromosomal genetic disorders and could be a useful diagnostic tool in the diagnosis of lesions and conditions of the oral cavity such as dental caries, periodontitis, cleft lip and palate (CL/P), and malocclusion. The scientific study of papillary ridges of the hands and feet began with the publication of the thesis of Joannes Evangelista Purkinje in 1823, although William Herschel (1858) was the first to experiment it in India. Sir Francis Galton (1892) reported the hereditary significance of fingerprints and biological variations of different racial group in his book: Fingerprints. Sir Edward Henry, in 1893, published the book—The Classification and Uses of Fingerprints—commencing a modern era of fingerprint identification. Charles Midlo along with others put forward one of the most referred book, Fingerprints, Palms and Soles, a bible in the field of dermatoglyphics. Penrose (1945) conducted investigations on Down syndrome and other congenital disorders. Schaumann and Alter, in 1976, documented Dermatoglyphics in Medical Disorders that gave the details of dermatoglyphic patterns in different medical disorders. It is the most common pattern on the fingertips. A total of 65% of the population possesses loops. A series of ridges enters the pattern area on one side of the digit, recurves abruptly, and leaves the pattern area on the same side. Ulnar loop: when the loop opens on the ulnar side and accounts for 60% of the loops. Radial loop: when the loop opens toward the radial margin and accounts for 5% of the loops. It is any ridge configuration with two or more triradii. One triradius is on radial and the other on the ulnar side of the pattern. Henry (1937) limited the designation of the term “whorl” to those configurations having ridges that actually encircle a core. Approximately 5% of the population has them. It is the simplest pattern found on the fingertips. It is formed by succession of more or less parallel ridges, which transverse the pattern area and form a curve that is concave proximally. Sometimes the curve is gentle, whereas at other times, it swings sharply so that it may be designated as low or high arch, respectively. Over the past 150 years, dermatoglyphics has been a powerful tool in understanding the basic questions in biology and genetics. Its analysis is now beginning to prove useful in the field of dentistry. Recognition of irregular fingerprints among the patients of periodontitis, dental caries, and other genetic anomalies such as CL/P has been the recent interest of authors and academicians. Disturbances at any stage during palate development (e.g., defective palatal shelf growth, failed or delayed elevation, and blocked fusion) can result in cleft palate (CP) with or without cleft lip (CP ± L). Scott studied dermatoglyphic prints from individuals with non-syndromic CL/P (n = 460) and their unaffected relatives (n = 254) from the Philippines and China. An increased radial and ulnar loops were observed in patients with CL/P. Periodontitis is a set of inflammatory diseases affecting the periodontium, that is, the tissues that surround and support the teeth. Periodontitis involves progressive loss of the alveolar bone around the teeth, and if left untreated, can lead to the loosening and subsequent loss of teeth. Periodontitis is caused by microorganisms that adhere to and grow on the surface of the tooth along with an overaggressive immune response against these microorganisms. Atasu et al. conducted a study with the aim of finding a fingertip pattern type that would identify the patients with periodontal diseases. When the fingertip patterns of the patients were compared with those of periodontally healthy individuals, the decreased frequencies of twinned and transversal ulnar loops on all the fingers of the patients with juvenile periodontitis (JP), a decreased frequency of double loops on all fingers and an increased frequency of radial loops on the right second digits of the patients with rapidly progressive periodontitis, the increased frequencies of concentric whorls and transversal ulnar loops on all the fingers of the patients with adult periodontitis, and an increased frequency of the triradii on the palms and soles of the patients with JP were found. In the light of these findings, the authors concluded that dermatoglyphics could be used together with other diagnostic methods such as clinical and radiologic investigations in identifying the patients from distinct groups of Periodontal Diseases. Tikare et al. revealed a statistical association between whorl patterns among children with Class I and II malocclusion. Reddy et al. conducted a study using dermatoglyphics to predict and compare Class I, Class II, div. 1, div. 2, and Class III malocclusions. A total of 96 subjects were divided into three malocclusion groups, that is, Class I (control group), Class II, div. 1, div. 2, and Class III (experimental group) in the ages of 12–14 years. The dermatoglyphic findings revealed that the craniofacial Class II, div. 1, div. 2 pattern was associated with an increased frequency of arches and ulnar loops and a decreased frequency of whorls, whereas in Class III, an increased frequency of arches and radial loops with decreased frequency of ulnar loops was observed. In predicting Class III malocclusion, based on the frequency of arches, the sensitivity values were found to be higher and more reliable than the sensitivity values of Class II, div.1, div.2 malocclusion. From their study, we observed that dermatoglyphics might be an appropriate marker for malocclusion. Dental caries is one of the most chronically infecting diseases in the humans since time immemorial. It is a multifactorial disease with its etiology revolving around the host, microbes, time, and substrate. But genetic susceptibility also plays an important role. Bhat et al., in 2012, conducted a study to evaluate dermatoglyphic peculiarities and caries experience of children who were deaf and mute. They observed that the frequency of whorls was more in caries group and the frequency of the loop was more in caries-free group. Madan et al., in 2011, conducted a study to determine the genetic aspect involved in the occurrence of dental caries through a cost-effective means. They observed that handprints of children who were caries free, especially girls showed maximum ulnar loops. The caries group showed maximum occurrence of whorls that were more prevalent in girls on the left hand third digit than in boys where the whorls were found on the right hand third digit, and also low total ridge count, especially in boys. Venkatesh et al. carried out a study to determine whether specific dermatoglyphic patterns exist, which help in predicting the occurrence of oral squamous cell carcinoma and oral leukoplakia. Arches and loops were more frequent in cases than in controls, whereas whorls were more frequent in the control group (P < 0.01). Loops were at higher frequency in the interdigital areas in cases than that in control group (P < 0.05). This study concluded that dermatoglyphic patterns may have a role in identifying individuals either with or at risk for developing oral leukoplakia and oral squamous cell carcinoma. 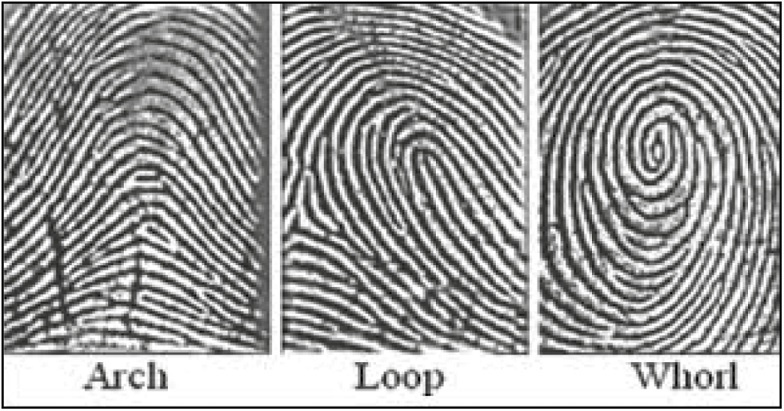 Fingerprints are known to be unique and unalterable, and hence an excellent tool for population studies, personalized identification, morphological, and genetic research. As the dermatoglyphics are genetically controlled characteristics, any deviation in it might indicate a deviation from the controlled population. They were considered as an inexact sign from which it has moved to an acceptable diagnostic tool. Hence, the future lies in these noninvasive techniques of diagnosis in all fields of medicine and dentistry. Dermatoglyphics has been in history since time immemorial and has not been much implicated in dentistry; more research will definitely help create a brighter future for the application of relationship of dermatoglyphics to abnormalities and diseases of the oral cavity. Prabhu N, Issrani R, Mathur S, Mishra G, Sinha S. Dermatoglyphics in health and oral diseases—A review. JSM Dent 2014;2:1044-8. Bhat GM, Mukhdoomi MA, Shah BA, Ittoo MS. Dermatoglyphics: In health and disease—A review. Int J Res Med Sci 2014;2:31-7. Kiran K, Kavitha R, Amitha MH. Dermatoglyphics as a noninvasive diagnostic tool in predicting mental retardation. J Int Oral Health 2010;2:95-100. Priya NS, Sharada P, Chaitanya BN, Girish HC. Dematoglyphics in dentistry—An insight. World J Dent 2013;4:144-7. Prathibha R, Abhilash PR, Sherlin HJ, Anuja N, Premkumar P, Chandrasekar T, et al. Conventional dermatoglyphics—Revived concept: A review. Int J Pharma Biosci 2011;2:446-58. Misumi Y, Akiyoshi T. Scanning electron microscopic structure of the finger print as related to the dermal surface. Anat Rec 1984;208:49-55. Tikare S, Rajesh G, Prasad KW, Thippeswamy V, Javali SB. Dermatoglyphics—A marker for malocclusion? Int Dent J 2010;60:300-4. Scott NM. Dermatoglyphic fingerprint heterogeneity among individuals with nonsyndromic cleft lip with or without cleft palate and their unaffected relatives in China and the Philippines. Hum Biol 2005;77:257-66. Atasu M, Kuru B, Firatli E, Meric H. Dermatoglyphic findings in periodontal diseases. Int. J Anthropol 2005;20:63-75. Reddy S, Prabhakar AR, Reddy VV. A dermatoglyphic predictive and comparative study of class I, class II, div. 1, div. 2 and class III malocclusions. J Indian Soc Pedod Prev Dent 1997;15: 13-9. Bhat PK, Badiyani BK, Aruna CN. Dermatoglyphics—A new diagnostic tool in detection of dental caries in children. Indian J Forensic Med Toxicol 2012;6:24-8. Venkatesh E, Bagewadi A, Keluskar V, Shetti A. Palmar dermatoglyphics in oral leukoplakia and oral squamous cell carcinoma patients. J Indian Acad Oral Med Radiol 2008;20:94-9.